Bauer Pottery & Bauer 2000 Pottery Collectors Page Links. The Bauer Pottery Company has reissued many of the pieces first brought to us by the JA Bauer Pottery Company of Los Angeles. The JA Bauer Pottery Company was the "Originator of California Colored Pottery" and today their ringware design pieces are sought-after collectibles. Many of these original pieces are sold for thousands of dollars. Thanks to the new Bauer Pottery Company, Bauer 2000 Pottery, is becoming a household name with thousands of pieces being produced and sold worldwide each year. 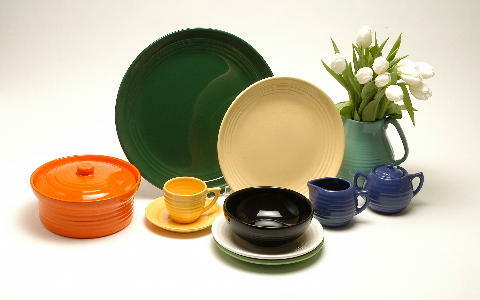 Bauer Pottery is already producing over thirty different items in fifteen beautiful colors. Plates, Serving Bowls, Coffee Pots, Oil Jars and so many other items are available to help you create a functional and beautiful living space. Hand Painted and Decorative Painting on Glassware, Wedding Flutes, Slates, Collectible Plates and Tinware in Shabby Chic Designs and Crafts by COUNTRY JOY CRAFTS All Original Country, English Country and French Country Arts and Crafts in Hand Painted designs for decorating and gift giving needs. tiles - peacocks, birds, gazelles, fish and floral design tiles. Indonesian handmade terra cotta pottery, painted flower pot & plant pot, decorative vase, large garden planters & pedestals, garden lamps, water fountains & garden water features, tamarind vases, terrazzo pots & planters, and stone garden statue & other natural stone items. Wholesale only. PayneEnterprise.net: Antiques, Collectibles, Computers, Beaded Jewelry, House Wares and more...PayneEnterprise.net brings an eclectic selection to the mix. Pioneer Heritage Shoppe: Offers exquisite dried flower wreaths, herb wreaths, twig wreaths and swags. Wedding decorating gift ideas. Nostalgic wedding party gifts, men's shaving mugs and shaving supplies, aromatherapy bath and body gifts and gift baskets. Handmade nostalgic country decorating and western decor with our collectible horse-drawn pioneer wagons and buggies. Wholesale inquires and Custom Orders Welcome. Birthday Gift Ideas and Presents for all Occasions! A large assortment of gift ideas to choose from. Here you will find the perfect gifts for Birthdays, Christmas, Weddings, Graduations or Just Because! Hand Painted Personalized Country Wood Crafts by SUNDANCE DESIGNS ~ FREE personalization. Whimsical sports, pet, nautical, wedding, baby & teacher gifts. Ornaments, RED HAT Ladies gifts, angels, hand painted wood signs, birthstone gifts, snowmen, gingerbreads, humorous plaques, birdhouses. Country & Southwest decor. Custom and Wholesale orders welcome. At Annabelle's Angels, we specialize in whimsically hand-painted terra cotta pottery that is perfect for your home and garden decor and personalized Angel themed gifts for those you care about! Smartshoppingworld Site Listing Directory - We Bring You the World of Arts and Crafts, Gifts and Collectibles and Fashion and Accessories! Cute handmade polymer clay crafts! Beads, jewelry, angels, mermaids, buttons, quilted, oriental and more. Craft links and resources. Unique handmade jewelry and pendant watches with gem stones. Everything is under 100 dollars. Handmade jewelry you'll actually wear. We trade links. We assemble custom wooden signs using a centerpiece and lettering of your choice for that special personalized gift. Browse through samples of more than 160 centerpieces available. Futures for Children store sells Native Amerian Indian jewelry, art, rugs, kachinas and pottery. Our native american store carries navajo blankets, navajo art and fetishes. Crafty Graphics - Specializing in creating and designing web sites and web set graphics for crafters! A FULL website design & maintenance service, domain name registration, graphics and website hosting!! Personalized, custom and finished handmade quilts, throws, wall hangings, Raggedy Ann dolls, custom gifts, antiques, home decor collectibles and furniture care and refinishing products. Free how to guides and gift recipes. Want a rugged western look? Stop by and look at our metal statues, bookends, and coat racks. Ya'll come by and say Howdy!! Secure online ordering!! Bosch and Kitchen Aid Mixers, Vita Mix Blenders by Vitamix, Food Processors, Grain Mills, Food Dehydrator, Saeco Espresso Machine, and other kitchen items! Contemporary art porcelain. Original pottery, wheel thrown, unique, individually designed & signed by artist June Alexander. A fabulous collection of colors rarely found that can be searched by color. <>Aspen Country Home & Garden Decor - Distinctive home decorations, theme decor, garden statues and rustic lawn ornaments, kitchen ceramics, decorative bookends and office accents, wildlife figurines, art sculptures and unique gifts.